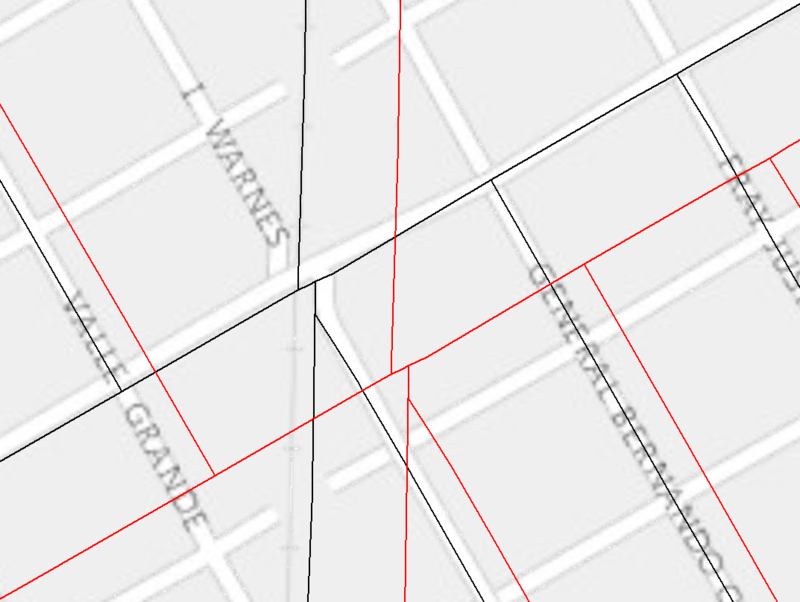 I have two polygon shapefiles representing district boundaries: Districts1 and Districts2. I looked at the projections for the files and for whatever reason, they're different. So the projection information for Districts2 looks fishy to me, but I'm not sure how to fix this... I tried projecting Districts2 into the POSGAR_94 coordinate system that Districts1 uses, but it didn't make any spatial changes. I don't know if the fact that the datum is unknown for Districts2 has anything to do with this. I also tried changing the data frame's coordinate system but that didn't do anything to better line up Districts2 either. Evidently I'm a bit lost; I've been trying to read up on projections and datums but I can't seem to figure this out. 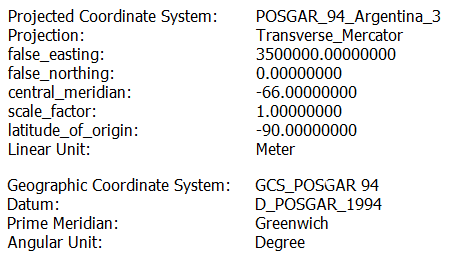 When faced with a geographic coordinate reference system (datum) definition that only has the ellipsoid information, the first thing that I do is look at the EPSG registry to see what geographic CRS are used in the area of interest. Putting in Argentina returns a long list of possible GeoCRS, so now I need to find the ones that use International 1909. Unfortunately, there are none, so you would need to know that International 1909 is another name for International 1924. There are several GeoCRS that use International 1924 including Campo Inchauspe and Hito XVIII 1963. There are two others but they're for very specific areas and not District 2. Once you've identified one or more likely candidates, redefine the geographic coordinate reference system (maybe work with a copy of the data) and try the various transformations. When you come accross a shift of features despite the fact that the coordinate system a properly defined (which seems to be your case), this is usually because the transformation between the two datum is incorrect or unknown. The rigourous way is to make sure that the transform is correctly defined. 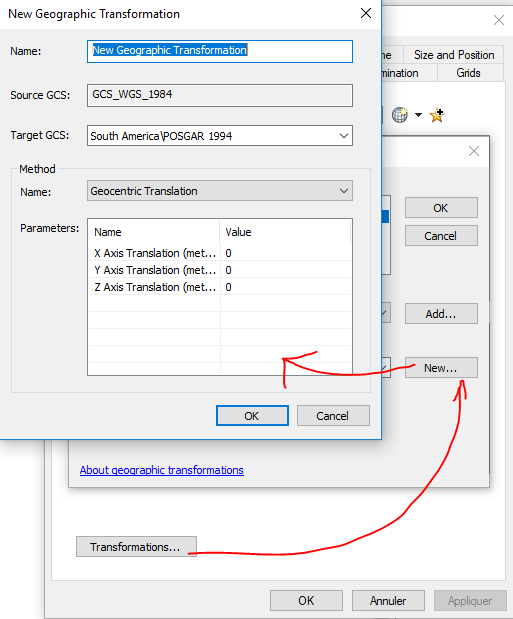 In addition to defining the coordinate system in the data frame properties, you must set a GCS transform. This is not done by default because there can be several transform. Note that the transform can be used both ways. If the transform is not in your list, try to find it on the Web and add it as a new transform. Sometimes, you don't find the values of the transformation because your datum is too rare, but some of the feature are homologous in the two datasets (i.e. you can find GCP's). Then you could project the data with undefined datum into the coordinate system with a well documented datum and then manually shift it. To do so, start an edit session and add the "spatial adjustment" toolbox. There are tools in this toolbox to create GCPs and adjust a model that will minimize the errors when fitting the second feature class on top of the first. This will only be an approximation, but on a small area this will be good enough for most applications. Not the answer you're looking for? Browse other questions tagged arcgis-desktop coordinate-system shapefile arcgis-10.5 datum or ask your own question. How to re-project a shapefile to be compatible with another shapefile or raster? When are .prj files included with Shapefiles? Using OS MasterMap and Transverse Mercator projection in ArcMap?